What if there is a way for you to make money while watching your favourite soccer league game? Soccer betting or Soccer gambling has been around for many years now, and it is already a much popular way to earn money doing what you love to do the most, watching soccer. And no, you do not actually have to play soccer or anything. You just bet on the events and win money. So, is it real? How do you earn money from watching the game? The answer is yes, it is real and a genuine way to earn a good income. For the how part and best soccer betting tips , keep reading this article. 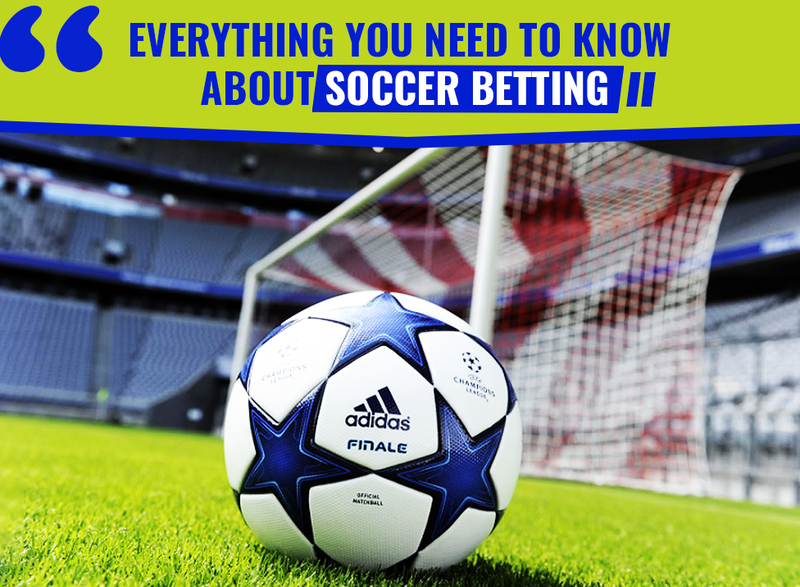 If you are planning to start in soccer betting, here you can learn everything you should know about this industry. It is a very popular type of sports betting in which the bets are placed on the various events associated with a soccer game. As you may already know, soccer is the most watched sport in the world, so it is natural for it to have a special place in the betting world as well. Betting on soccer is common in almost every country where this game is played. Soccer betting is more or less similar to professional baseball wagering, in that it also involves the use of moneyline, which is the line on which bets are placed. One difference between soccer betting and baseball betting is that in soccer, you can also bet on a draw/tie. It means that when you bet on a team, you will win the bet only if your chosen team wins. If your team loses or ends in a tie, you lose. What are soccer betting moneylines and how to read them? Moneylines are specifically used in sports betting. There are favourites (winning choice) and underdogs (less popular) in each of these games. A moneyline is defined by assigning a budget to each of the two teams, which in turn, decides the betting amount. Moneylines are directly associated with the win or lose of the teams. Between a match of two soccer teams, the betting wager for the less popular team (or the underdogs) will be low and the winning amount will be high because the probability of them winning is lower as compared to the other team. It means that the Real Madrid is the favoured team and so, the betting wager is high for the tea,. It will cost you $140 to bet on the team in order to win $100 payout on their victory. On the other hand, you have a chance to win $150 by betting $100 on the Arsenal since they are the underdogs in this game. In short, you have to spend more money to bet on Real Madrid and the winning amount will be lower. The bigger the favourite, the lower the payout. These matches also usually have the option for betting on the draw. On this moneyline, the bettor can earn $190 by betting $100 on the tie of the game. If there is no option to bet on a tie, your betting amounts will be refunded if the game ends in a tie. However, the soccer bets are also sometimes played without the option of a draw. These are called 2-way moneylines. The team with the higher probability of winning is assigned low odds in order to create a balanced market for both the teams involved in the game. This is to make sure that not all the bets are placed on the favourite team, which is very likely in a normal situation. And so, the odds are what keep the betting game interesting. The payouts are larger and the betting wager is less for the underdogs. People, who have a low betting budget and/or want to win more will naturally place their bets on the undergrounds, even if the winning probability is comparatively lower. There is also one other type of betting moneyline in soccer, called goal lines or over/under line. In this, a total is posted such that the bettor has to wager either over a certain number of goals or under that figure. For example, if 2.5 is set as the over/under line number, the bettor wagering on the over will win only if his team scores 3 goals or more. And those who are placing bets on the under will win only if their team scores less than two goals in the game. The decimal number makes sure that there is no tie in the bet. Apart from the above-mentioned ones, there are other types of soccer bets, like proposition bets in which bets are placed on events in an ongoing game, such as the time of the first score, the first team to goal, or the number of goals by the halftime. To place such bets, you must have a really good knowledge of the particular team or the game. Here are some points that can increase your chances of winning your soccer bets. Stay up-to-date: Be sure to stay informed of all the match news and updates of your favourite teams and games. This will help you make better decisions while betting. Mix-up things: Instead of placing all your wagers on a single team or bet, put your money on different bets. Also, experiment your bets by occasionally wagering on underdogs. Study team records: When you start reading about teams and their performances in various matches, you will start seeing a pattern. Some teams perform well in a home match, but not so well in an away game. if you know this, you can decide which team you should bet on and when. Make sure to choose the right type bet depending on the situation. Analyse the situation and choose a bet that can give you maximum returns on your investment.